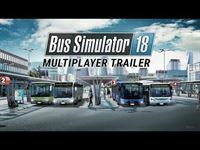 Moenchengladbach/Germany, May 30, 2018 – As the release of Bus Simulator 18 on June 13, 2018 draws steadily closer, astragon Entertainment GmbH and the developers of stillalive studios would like to offer their fans a closer look at the game’s cooperative multiplayer mode today. In Bus Simulator 18 players will get the unique opportunity to found their very own bus company with up to three friends and lead it to success in the fictional European city of Seaside Valley. Thanks to the new synchronous multiplayer mode an exciting gaming experience for all bus and simulation fans! Not only will players get the chance to manage and expand their bus fleet or create their own network of routes in Bus Simulator 18, they will also be able to chat with each other in real-time and start driving their buses synchronously. While driving around the city they will not only be able to meet and see each other in real-time as well, but also change buses to get a lift with one of their colleagues or completely switch buses to complete the route of another bus driver. Bus Simulator 18 for PC will be first available on June 13, 2018 in retail and digital stores. The recommended sales price will be 29.99 Euro, 34.99 USD, 26.99 GBP.